France’s colony in Canada is in trouble. A British fleet has landed an army on the shores of the Saint Lawrence River, they’re marching upriver to Quebec. An army of the Iroquois Confederacy are marching to Montreal, the other major French settlement in the area. A small French army in Quebec is caught in between the invaders. Meanwhile in Europe, France, like France’s Canadian colony, is in between two threats. France’s fleet won a battle and captured a British ship of the line, but is outnumbered by Britain’s navy and falling back to the port of Brest. In the east, France’s army is fighting Austria and Austria’s allies. While I was selecting my troops to cross the shallow part of the river, I noticed a unit of American Long Riflemen - on the opposite shore - running through a patch of trees to hinder my river-crossing. But with my instinct for Classical melee warfare, I immediately dashed my cavalry across the river, and plunged them directly into the American Long Riflemen. The American unit routed almost instantly. This was a glorious situation since it showed that cavalry was still a killer unit even during the Napoleonic period. Obviously, with the supremacy of gunpowder, you have to be extra-cautious with your horses. But just to reiterate a point: cavalry is still a vicious arm to contend with. And I was most pleased with that. This example shows how changes - sometimes simple ones - can make a significant difference to our experience of the game. (Changes can also lead to problems. When I set the graphics to High, I experienced lag in sea battles in some weather conditions. The solution was to set the graphics quality for the water to Low - everything else could remain on High). Can the game's full potential be unlocked with mods? Many modders were disappointed by the difficulties with modding Empire, compared to earlier games. Using earlier games, skilled modders could conjure entire worlds into being, building mods such as Third Age Total War which are still being developed, for example for the sub-mod DCI: Last Alliance. With Empire, no modder has succeeded in creating new campaign maps. Some, such as the Imperial Splendour team, have created new, unique buildings for the campaign map. Others, the modders behind Imperial Destroyer, succeeded in turning wilderness areas of the map (which aren’t part of any region) into playable regions. Despite the difficulties, skilled modders have made significant changes to the game-play. Modders continue to release new mods - at the time of writing, recent mod releases include The American Revolution 2.0 (January 2019), Imperial Destroyer 6.1 (January 2019), The War of 1812 1.2 (Feburary 2019) and Imperial Splendour: Rise of the Republic 1.1.9.9 (a beta version for the 10th anniversary of the game's release, March 2019). Different people have different expectations and are frustrated to different amounts by the same issues. If your minimum requirement is the ability to create a new campaign map, you’re not going to be happy with Empire. However, many features can be changed. For example, if you find siege battles repetitive, Shokh Hates Sieges will dramatically reduce the number of siege battles. If battles feel too fast, realism mods such as Empire Realism or Imperial Splendour slow them down. If you'd like a more realistic Ottoman Empire, you can try the Ottoman Total Overhaul. If you'd like more playable factions, then many mods offer this including Empire Total Factions and All Factions Unlocked. Some mods unlock factions and add new features, such as Empire Realism, Imperial Splendour, Minor Factions Revenge and DarthMod. If you'd like to experience battle in the 17th or 19th century, then you could try Colonialism 1600 AD, 1800, The War of 1812 or Victoria Total War. If you'd like more units, then unit packs are available including the Additional Units Mod. If you're frustrated by bad decisions by the AI, you may want to see the difference made by Bran's Empire CAI – and there are many more mods to discover. This review won't do justice to the full variety of experiences which mods for Empire offer. If you'd like to know more, there's an Empire Total War mod recommendations thread and, for modding tools and tutorials, an Empire Mod Workshop. For writers of After Action Reports, there's a dedicated AAR forum in the Writers' Study. If, for you, the specific mechanics of Medieval II represent how Total War games are supposed to work, then it’s likely that you won’t be satisfied with Empire. You’ll miss the pre-battle speeches, the family tree, the visceral combat which Flinn described in his 10th anniversary review of Medieval II, and other aspects of earlier games. Despite this, and despite frustrations with parts of its game-play, I still see potential in Empire and enjoy campaigns. It seems that I’m not alone. The examples of mods listed above show that modders have invested many hours in adapting the game to reflect their visions of 18th-century warfare – and also the warfare of the 17th and 19th centuries. What, then, are the frustrations, and why – despite them – do I still enjoy the game? Strangely, I keep wanting to compare factions in Empire Total War to factions in Rome-themed Total War games. For players who are new to Total War and who'd like the reassurance of a faction which, like Rome, has a strong starting position and a good all-round roster, there's Britain. But Britain is not the only faction to offer something similar to the experience of playing as Rome. If you like the idea of leading the soldiers of a republic, the United States (playing on the world map in part 4 of the Road to Independence Campaign) may be for you. Sweden and Poland-Lithuania both have well-balanced rosters with some powerful elite units, while the Ottoman Empire offers an equivalent to Rome's reforms of Gaius Marius with the development of a more modern army, the Nizam-i Cedid or "New Order", by Sultan Selim III (Stanford Shaw, The Nizam-I Cedid Army under Sultan Selim III 1789 - 1807). Nizam-i-Cedid infantry in square formation guard the left flank of an Ottoman army, protecting the riflemen and heavy cannon. If you like the challenge of starting as the city-state of Sparta, surrounded by rivals against whom you'll lead infantry of exceptional quality - Prussia's for you. Some players enjoy starting with an old, fracturing empire (the Seleucids) - the Ottoman Empire or Austria offer an 18th century equivalent. If you like playing a young lion taking on an old empire or the challenge of a faction whose roster relies on cavalry, the Maratha Confederacy awaits. If the challenges of a dispersed empire as Carthage in the Roman era are attractive, the United Provinces uniquely offers a faction with a region on each major campaign map (the Americas, Europe/Middle East/North Africa, India) while France and Spain also offer the challenge of holding lands in Europe while defending colonies. As we've already seen, factions offer different challenges. Russia and the Ottoman Empire have a lot of of land but are held back in the early campaign by a less powerful roster. Factions in Empire Total War often find themselves under threat from two sides. For example, Sweden tends to find itself at war with Denmark and Russia and Russia with Sweden and the Ottoman Empire. In my France campaign, I was fighting Britain and Austria. European factions are similar to each other, but their different strengths add to the game's replayability. For players who are used to the ability to play smaller factions, the options are more limited. In the Warpath campaign, there's a challenge in defending your lands from colonial powers as a Native American faction. Smaller factions such as Denmark, Venice, Hannover, Portugal, Georgia, Persia, Morocco and Mysore, look like possible starting points for fun and challenging campaigns. They can be unlocked with mods but can't be used otherwise. At times, I'd have liked the faction variety to be developed more. For example, when playing as the Maratha Confederacy, it feels a little strange to research "improved grenades" when your roster includes no grenadiers or "machined rifling" but be unable to recruit riflemen because their roster has none. It's understandable that playable factions use the same technology tree, when technologies can be traded - and it's not difficult to mod the game, for example to allow any faction to recruit riflemen if they research the appropriate technology. Even so, it's a shame at times that faction diversity wasn't taken further and that more factions weren't made available for players - particularly since experienced players tend to say that they'd like more challenging campaigns. The people then by that time had been under rule of Arab, Turkic, and even Mongol regimes. Although not all of them had been evil, most of them tended to be oppressive, often meeting out barbaric punishments to their enemies. In fact, there had been tales of invaders having their enemies skinned or trampled under the foot of elephants. There was also the frequent practice of forced conversion by giving people an option – either the invader’s faith or the sword. There are frustrations on the campaign maps. AI factions don’t often send armies by sea (although sometimes they do, particularly in the late 18th century). Most of France is a single region at the start, which seems odd when German and Italian states are represented by several regions (perhaps making France a single region was intended to cause a French revolution to occur when the effects of industrial and intellectual development meant that people would no longer tolerate an absolute monarchy, as happened historically?). When a player starts a campaign as Britain, the opening voice-over warns the player to establish a foothold in India before their European rivals, such as France, do the same. However, with the exception of the United Provinces and Portugal (which have colonies in Sri Lanka and Goa at the start of the campaign) I’ve not seen European nations send armies by sea to attempt to conquer India, as they historically did. When I tried a campaign as the Maratha Confederacy, Britain tried two naval invasions, one early on and the other in the mid-campaign. I was happy to see these happen and would have liked to see Britain bring larger armies, as well as to see more attempts by European powers to establish a foothold in India. Perhaps the reluctance of European nations to send expeditions to India isn’t too surprising, because of the distance and the risks involved in any attempt. In my France campaign, I didn’t take the risk of sending a force to India until almost the end of the campaign. However, when playing as the British I haven’t seen European nations try to land troops in Britain, which is more surprising considering the short distance. There’s also an element of frustration in seeing the same nations expand in the same way in a series of campaigns. For example, unless the player intervenes, the Maratha Confederacy dominates India and Spain conquers Portugal, while Prussia, Poland-Lithuania and Austria-Hungary engage in a long struggle. More uncertainty about these kinds of developments would add to the challenge and enjoyment of campaigns. Despite the frustrations, I very much enjoyed the challenges of my France campaign. It was exciting to face a war on two fronts in the Americas and a war on two fronts in Europe at the same time. I had to manage my resources carefully and plan ahead. I decided to take on my opponents in the order of difficulty, focusing on expanding in one area at a time while fighting defensively elsewhere. My easiest target were the Iroquois Confederacy, since their roster has no reliable answer to France's line infantry and cannon. After defeating the Iroquois, I concentrated my efforts in Britain's colonies in North America. If I didn't defeat them fairly early on, I might not have been able to defeat them at all. After that, an army marched east from Paris towards the German states which allied with Austria, hoping to reach Vienna and end the war in the east. If I could end that war, then it would be time to take on Britain's fleets and armies in Europe. The ground through which we had to advance was much undulated, and in full crop of rye, which is that rich and luxuriant country grows exceedingly high, and on this account obstructed observation. As we advanced on the leading company of our regiment … observed the French cavalry advancing to the charge. Orders were then given to form square … the enemy perceiving that we were preparing for them, instead of advancing, made a movement to the left, broke in upon the open column on the 69th Regiment, which being on the low part of the field had not observed them. - quoted in Bernard Cornwell Waterloo: The History of Four Days, Three Armies and Three Battles (William Collins 2015 p. 97). In Empire’s battles, I feel that I should be more nervous of enemy cavalry than I am. Perhaps this is because I watch my flanks and form infantry into square when cavalry approach. Sometimes that’s true – but sometimes it’s because the AI doesn’t use cavalry as effectively as it might have done. RVFVS’s review mentioned repetitive battles. It’s true that battles in Europe can sometimes feel repetitive because both sides tend to rely on the same types of units – musket infantry, melee cavalry and cannon. However, warfare in India, Africa and the Americans can be quite different, as units may rely more on melee attacks, stealth or both. Also, because Empire’s Grand Campaigns runs from 1700 to 1800, warfare evolves. Your early musket infantry don’t even have bayonets or the training needed to form square. Your early cannon fire only round-shot, which is useful but inflexible. By the mid-18th century, your line infantry have bayonets and proper training, your cannon can devastate infantry with canister shot and you may have newer units such as howitzers and horse artillery (depending on your faction). By the end of the century, any frontal attack will tend to suffer heavy casualties, as line infantry fire rippling volleys, artillery use new types of ammunition and your firepower is reinforced by light infantry and elite regiments. When playing Empire, I miss features of newer games which would really make a difference in this era. For factions relying on stealthy hit and run attacks, guerrilla deployment (deploying units anywhere on the battlefield except for the enemy’s starting area) and a true line of sight system would add an extra dimension. Since Napoleon’s armies suffered terrible losses from the Russian winter, it’s a shame that there’s no heat or cold attrition. Units can suffer fatigue on the battlefield because of heat or cold, but they won't suffer losses on the campaign map because of extreme conditions. There could be tropics attrition, too. In 1739, when Captain Robert Jenkins’ ear was cut off for illegal trading, the War of Jenkins’ Ear began – a war in which a British expedition in 1741 to Cartagena and Santiago de Cuba suffered massive losses (22,000 of the 28,000), mostly from disease (source). Combined land and sea battles would have been exciting, as well. There could be 'cutting-out' expeditions, where ship captains send their marines into a port to try to steal enemy ships, and players could choose either to exchange fire between cannon in coastal forts and naval artillery (such as mortars carried by bomb ketches), or to attempt to storm the coastal fort with marines. Also, there’s no special event to add extra challenge to late stage of the campaign, such as Realm Divide (a feature of Shogun II in which other factions form a coalition against the player). To be fair, the game's diplomacy mechanic includes a territorial expansion penalty which makes a nation which expands quickly upopular with other factions based on the same campaign map. Particularly with expansion in Europe, this can cause a player to have a similar experience to the Realm Divide mechanic: a coalition forms against the player. However, it’s expecting too much to judge Empire for not including features which hadn’t been developed yet. It shouldn’t be forgotten that Empire introduced new features. For the first time, we could play sea battles and this included the ability to capture and use enemy ships, as nations historically did at this time. A technology tree adds to the challenge, requiring players to think strategically about their priorities. Some small features add extra interest. For example, in battle when selecting units we hear dialogue in the language of the faction we're playing. When a rebellion happens in the player’s capital region, you have the option of joining the rebels. If you successfully re-take your capital, then you resume command of your faction with a new type of government. There are plenty of imperfections in the battles, but overall I enjoy them nevertheless. Sometimes, a Native American army sends one or two units at a time in a futile attack on a line of prepared musket infantry and cannon. However, the game can surprise me. When France landed an expeditionary army in the homeland of the Inuit, to end their repeated raids on the French colony of Newfoundland, my army was ambushed. The Inuit army which ambushed France's soldiers was reinforced by a second army and both attacked my army aggressively, coming close to re-enacting the Battle of the Monongahela. In a similar way, while sieges can be disappointingly easy, as cannon brought close to a breach can devastate the enemy with canister shot, some other battles were harder than I expected, as the AI made direct attacks on my artillery, putting them out of action. Britain won its war against the French, but it was we, the American people, who bore the cost. Our treatment at the hands of the British fuelled fires of discontent which spread quickly through the colonies … across America, talk of rebellion became commonplace and despite several attempts to negotiate, our demands fell on deaf ears. It was this constant refusal to accept a new order in the colonies that would be the spark which lit the fuse of revolution. I find myself here, watching with pride as my fellow Americans tear down the tyranny of the British. We fight for freedom, a driving force stronger than the word of any general. We will need this strength in the battles to come. The British will not easily relinquish their control over our home. The Continental Army relies initially on militia, but the defenders of the United States can include elite infantry regiments such as the 2nd New York, shown here facing an attack by two British elite regiments, the 33rd Foot (in red coats) and the King's Royal Regiment of New York (in green). If you win the war for independence as the United States, you'll be able to build powerful heavy frigates such as the USS Constitution, shown here engaging two British frigates. The idea of fighting for freedom was an inspiring motivation for the tutorial campiaign. The tutorial campaign doesn't follow strictly the history of the American Revolutionary War. For example, it seems strange to me that, after the Battle of Bunker Hill, the US player is left in control of Boston, while Britain controls the rest of the Thirteen Colonies. As I understand it, broadly the situation after Bunker Hill was the direct opposite of this: the British remained in occupation of Boston but lacked effective control elsewhere. (This description over-simplifies the situation, since not everyone in the Thirteen Colonies supported the war for independence.) Despite this, the Road to Independence campaign is very enjoyable. The idea of fighting for independence remains a powerful motivator, combined with the experience of starting as the 'underdog', leading militia against regular troops. I enjoyed the idea of fighting for independence in the tutorial campaign so much that it deprived the Grand Campaign of some of its shine. After leading under-supplied volunteer soldiers in a desperate fight for freedom, the idea of leading a powerful nation to create a large empire seems less inspiring! One way to achieve this would have been to use the 'rebellion' mechanic of the game to allow the player to start as a rebel force; another would have been to allow the player to begin as a small or emerging nation. However, we can take on the challenge of fighting the powerful European nations when playing as the Maratha Confederacy or as the powerful but fading Ottoman Empire. The Warpath Campaign allows us to lead Native Americans against the muskets and cannon of the colonists. Naval warfare is a new feature of the game; how well is this implemented? 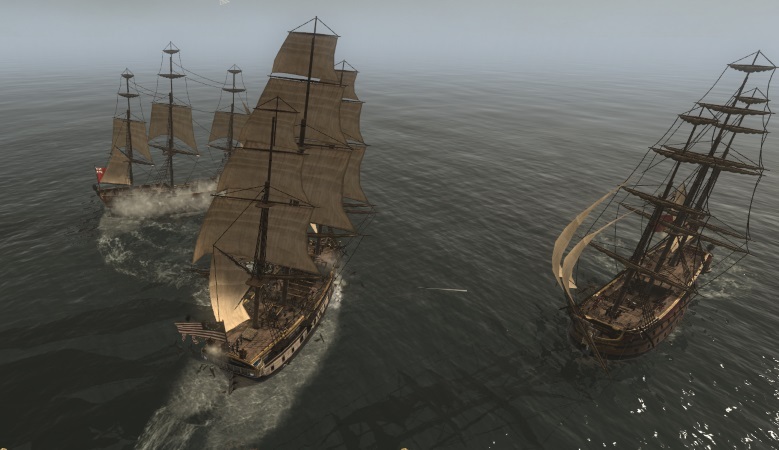 Naval warfare in Empire Total War has a 'rock, paper, scissors' dynamic. Ships of the line defeat frigates and other smaller, faster ships. Frigates and smaller ships have the speed needed to defeat artillery ships (bomb ketches and rocket ships). Artillery ships can do significant damage to ships of the line. This isn't historical; major sea battles of the era involves engagements between ships of the line, while smaller ships scouted ahead and relayed signals. The number of cannon on Fifth Rates frigates seems rather high as they have 48 guns. For example, British frigates during the 18th century tended to have between 20 and 38 cannon, until heavy frigates appeared in the 1790s. In the game, all nations with navies use the British rating system (First Rate ships of the line, Second Rate and so on, down to Sixth Rate frigates), however historically this was used by Britain, not the navy of every country. AI factions tend not to repair their ships, which can make some sea battles easier than they would have been. In my campaign as France, no nation ever built a First Rate ship of the line from 1700 to 1800 (I know this because a news message pops up when a faction does this for the first time); historically, the British navy had nine First Rates (then classified as ships with 86 to 100 guns) in the year 1688 (Ben Wilson, Empire of the Deep: The Rise and Fall of the British Navy, Phoenix 2014 p. 226). Despite all of this, naval battles in Empire are fun. The ability to capture and use enemy ships, as navies did historically, adds an extra dimension - particularly since other nations may be able to build ships which your nation cannot (such as the Fluyt, which can only be built by the United Provinces and the Pirates, or the heavy frigates carrying 24-pounder cannon which can only be built by the British and Americans). Listing shortcomings and problems in Empire Total War is easy - and yet the game is enjoyable (at least, for me) and has potential (as shown by the efforts of many modders). There are moments of disappointment - such as seeing the enemy throw away their cavalry by riding them in front of your musket infantry, or make their artillery ineffective by setting them up in a hopeless position. There are clear differences between the game-play in Empire and historical warfare, for example in the 'rock, papers, scissors' dynamic of naval artillery, small fast ships and ships of the line in sea battles. Despite all of this, there are moments of inspiration (especially, for me, in the tutorial campaign), of excitement and of surprise. The progression of technology on both land and sea adds interest and the vast scope, with three major campaign maps plus four trade theatres, requires players to manage resources carefully. We may have an army with elite units or a fleet with very powerful ships of the line, but our best forces can't be everywhere at once. Combining these features with the different strengths and weaknesses of different factions adds an extra dimension to campaigns. For example, it may not be difficult to conquer India as the Maratha Confederacy, but in the late campaign the Maratha musket infantry can't learn to fire by rank, creating a major disadvantage compared to European armies. The Marathan player has access to powerful cannon and cavalry and it seems that it's intended that these will be used in combination to defeat the powerful late-game infantry of your enemies - a challenge for any player who has become used to simply recruiting elite musket infantry and watching enemy armies broken by disciplined volley fire. For me, there's a lot of fun to be had - and a lot of experimentation to try, for example by capturing and using enemy ships and by transforming your government through a rebellion in your capital region - even before we add the extra dimensions which mods can offer. In my France campaign, France emerged as the victor of my equivalent of the French and Indian War. Just as, historically, victory in North America gave increased wealth and confidence to the British, so in this campaign France gained in strength because of this success. France's armies in Europe were reinforced by colonial troops, some of whom were trained as light infantrymen. This additional strength enabled France to win the war in the east, despite strong opposition from Austria and their allies. With no enemies remaining elsewhere, it was time to land an army in Britain, to put a decisive end to the rivalry between France and Britain. France's army landed in Ireland, left Ireland under Irish control and occupied Edinburgh. (At this point, I would have liked to have the ability to have liberated Ireland - since the Irish rebellion sadly meant that Ireland was at war with France. Unfortunately, the ability to liberate factions was not introduced until Napoleon Total War.) From my base in Edinburgh, my French army sent cavalry raids south, to devastate the British economy and disrupt the ability to Britain's armies to defend England. These cavalry raids were decisive in enabling France to defeat the last British resistance. (I think the raiding mechanic works whell; when the player sees their small settlements burning on the campaign map, this is a powerful motivator to strike back against the raiders.) Holding London was difficult, especially since France can't recruit dragoons (which have a public order bonus) in Europe. There were two major battles against British rebels before France's control of Britain was firmly established. We might expect that, after France defeated the Iroquois and the British colonies in North America, and conquered Austria and Britain, France would have an easy ride to the end of the campaign. However, in this campaign, France's dominance was strongly contested. As the Maratha Confederacy were expanding into eastern Europe, I was expecting a war with them and their ally, Russia. I wasn't expecting to need to fight Prussia at the same time. Prussia had taken over the lands controlled by Denmark, Sweden and Poland-Lithuania at the start, building a significant empire - defended by formidable armies. However, Prussia joined Russia and the Maratha Confederacy in a coalition against France, creating an exciting end-game in which I met the victory conditions only in the 1790s - shortly before the campaign was due to end. The late-game is not guaranteed to be challenging - as with the individual battles and the specific wars, sometimes they're easier than they could have been and sometimes they can surprise you. Perhaps it's the combination of these elements - the shortcomings and the exciting potential - of this game which keeps players playing and which motivates modders to continue, despite the setbacks. If you haven't tried Empire Total War, then I hope this review will help you to decide whether it's for you. Thank you for reading! Thanks! If you liked this article, I recommend checking out the Wiki's front page, which currently includes special features on Empire Total War and ETW mods, to celebrate the game's 10th anniversary. Thanks for this Alwyn! Empire is one that I have still never played but always wanted to (specifically for all those exciting new developments it included, which you mentioned). When the game came out my PC was nowhere near able to handle it (being barely up to standard for Med2) and I had that same rig for years afterward. It was only in the last couple years that I got a new computer and could try all of these titles I've missed, but now I find myself short on time for such things. This article makes me want to find that time to try out these games, as I am sure I've been missing something. I can see a lot of opportunity for good AARs here as well, especially with this option to join rebels in the capital and overthrow the government. All in all, a great review, and I think you've definitely helped me make up my mind about trying Empire! Very well-written presentation, as always, Alwyn! For me, Empire Total War is the only game, whose vanilla version I find too irritating to play. In any case, if you are interested in any information about the release of the game, Uncyclopedia features a very juicy and funny article about it. I sincerely hope that some stubborn fans of early modern warfare get hired and promoted by CA, as a sequel to perhaps the most underrated game in the series is sorely needed. Even today, thousands are playing it every day despite the troubled reputation that it still has. Alwyn, another thing I almost forgot. You can force and "ad hoc" liberation of sorts, by letting a province rebel and deliberately losing the battle for the capital. You start out being at war with the new faction, but they do appear and can be negotiated with and made into allies. Great write up and summation. In my opinion, empire is the best total war game ever made, and i've been waiting for an "improved" version/sequel from CA and SEGA for a decade now! Don't think that's happening, but the incredible modding community has been re-inventing the game for me year after year. Delightful to read your article about one of my favourite games, thanks! I can't play the Vanilla game, the game is to brocken with thousands of bugs and problems..! Thank God that we have some awesome mods and great people that still doing work to fix that problematic game and only with the mods you enjoy the game and of course i will not advertise you can find it with easy and have fun with ETW. I would love an ETW2 but i don't thing would happen but i have a door open because CA did some no 2 games of series like MTW2, Shogun2,Rome 2 so why not an ETW2 that with todays graphics and CPU/GPU and new engines the game would be awesome of course with some mods..!! Imo from a gamer that played it all and won most of them..
My favourite era is Medieval, but EmpireTW easily the best TW game ever, also brought the biggest advancement to the franchise (Naval combat) and still the only decent naval combat of any TW game!, still cant believe every, EVERY TW game is sword / shield / bow and they have never revisited this or the 1600's era since! Great article and well written, Alwyn! Empire, regardless of the criticism in it's past always, has a special place in my heart! A great read, as usual! I enjoyed your take on the game (even though my feelings are somewhat different) and especially liked the inclusion of historical research.